Internal turmoil provoked in 133 BC by economic stagnation in the city of Rome, slave revolts without, and dissension in the military precipitated a period of unrelenting political upheaval known as the Roman Revolution, the Late Roman Republic, or the Fall of the Republic, 133-27 BC. In essence, the republic system of government underwent a painful and violent transition from irresponsible oligarchy to a more accountable autocratic form of government. While it is difficult to appreciate the political and social issues that provoked the incessant political disruptions of the late Republic, it is possible to discern a pattern in the devolution of legal, constitutional authority in the Republic. It is possible to identify FOUR steps to the collapse of Republican authority. 1. THE RISE OF POPULAR TRIBUNES, 133-121 BC, two brothers, Ti. And C. Sempronius Gracchus exploited the power of the plebeian tribuneship to seize power in Rome. They essentially used their sacrosanctitas to veto all other public activity in the city in order to force the senate and the magistrates to focus on their own political agendas. They tried to restore order to the military by reclaiming public land and putting landless poor citizens back on land. C. Gracchus also attempted to grant Italian allies Roman citizen status. Both men were killed with their political followings through urban mob violence fomented by the aristocracy. 2. THE RISE OF PRIVATE ARMIES. When the oligarchy failed to resolve the military problem, Roman generals, specifically C. Marius (consul 106, 104-100 BC) and L. Cornelius Sulla (consul 88, dictator 82-79 BC), recruited private armies more loyal to themselves than to the state. In addition to the draft, they recruited landless poor citizens by offering them bounties and land upon discharge. The soldier's status as Roman or allied mattered little to these generals either, both of whom made extensive grants of citizenship to allied forces. Ultimately, the two men came to blows in 88 BC in the midst of the Social War and the Asian rebellion induced by Mithradates. So violent were popular feelings that Sulla was able to persuade his field army in southern Italy to march on the city of Rome to expel Marius and his followers. So began the first Civil War and the gradual transference of soldiers’ loyalties from the laws of the state to the persons of their commanding officers. Sulla ultimately prevailed against both Mithradates and the Marian element in Italy (Marius having died in 86 BC), and attempted to impose a reactionary political reform on Rome as dictator (Dictator rei publicae constituendae = Dictator for the purpose of restoring the Republic). 3. THE FIRST TRIUMVIRATE, 59-53 BC. Three men, Cn. Pompeius Magnus, M. Licinius Crassus, and C. Julius Caesar, combined their influence to seize power in Rome. Pompey was an extremely popular general who defeated numerous enemies of the oligarchy, including a rebellion in Spain led by the renegade Roman general Q. Sertorius, a Mediterranean wide rebellion by the Cilician pirates, and the final defeat of King Mithradates VI of Pontus. Pompey had a loyal private army, but proved politically incapable of delivering on his promises of land and bounties. As an officer of Sulla during the Civil War, Crassus had made himself the wealthiest man in Rome by profiting from Sulla's proscriptions, that is, the outlawing of Roman citizens by putting their names on lists and putting a price on their heads, wanted dead or alive. All proscribed citizens saw their civil rights nullified and their property confiscated and auctioned off by the state. Crassus exploited the proscriptions to acquire perhaps as much as 20% of the property in the city of Rome and countless estates throughout Italy. He used his wealth to buy influence in the Senate and throughout the urban populace and emerged as a powerful, but surreptitious influence on the roman state. Caesar began his career in a seemingly hopeless situation as the nephew of C. Marius confronted by the dictatorship of Sulla. As a young aristocrat he excelled at manipulation of the symbols of Marian reform and public generosity and became the darling of the masses by the late 60s BC. By offering his political abilities to aid Pompey and Crassus with their political agendas, he rose to the consulship in 59 BC basically to work as a tool for his two more powerful partners. He delivered necessary legislation in the face of senatorial opposition and received for his effort a 10-year extraordinary command in Gaul. Intense rivalry existed between these three dynasts, but so long as they maintained their illegal political association, the senatorial aristocracy was powerless to thwart them. Ultimately, Crassus was killed while fighting the Parthians in Mesopotamia in 53 BC and Pompey distanced himself from Caesar. He hoped to use the aristocracy to reduce Caesar's influence with the army in Gaul, just as the aristocracy hoped to use him for the same purpose if only to discard him once Caesar was destroyed. However, Caesar's army proved superior during the Second Civil War (49-46 BC). Pompey was defeated at Pharsalus and killed in Egypt, and the rest of the oligarchs opposing Caesar were mopped up across the Mediterranean. 4. CAESAR'S DICTATORSHIP (46-44 BC). Having defeated all his enemies, Caesar was granted a 10-year dictatorship for purposes of restoring the republic. His solution was to reconstitute himself as a Roman form of Hellenistic divine king or ruler. Since 510 BC however, the Romans had prided themselves with having obtained their freedom by expelling their Etruscan King. The very word king, REX, was anathema to the Republic mentality. Roman citizens had a civic duty to suppress any attempt at tyranny though political assassination and could do so with impunity. 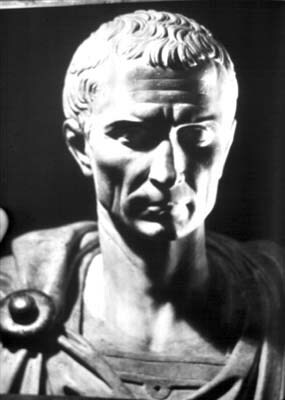 Although carefully avoiding the title "rex", Caesar attempted to collect for himself all facets of constitutional authority, serving at the same time as dictator, as consul, as Pontifex Maximus, and as Plebeian Tribune for life. In early 44 BC he declared himself DICTATOR IN PERPETUO (actually inscribed on his coins). He was murdered by a conspiracy of some 60 odd senators a few weeks later. At this point the precedent of rule by one man had been established at Rome. The only question remained which of his supporters would most likely succeed him to this position. This turned out to be his great grand nephew, C. Julius C. F. Caesar Octavianus, or Octavian. 1. Booty and profits of war. Roman overseas conquest resulted in too much wealth coming into Italy too quickly to enable equitable distribution throughout society. In general, wealthier elements benefited while lower elements failed to keep pace. In addition, rising expectations of profits from war led to abuses and illegal behavior by governors and generals in the field. The lex Calpurnia of 149 BC established a permanent court for extortion in the provinces. The prospect of profiting from war led to heightened competition for high office as well and extensive electoral bribery. 2. Heightened Status of Roman Senators. The Roman aristocracy was now recognized as important world leaders. Senators and wealthy knights engaged in extensive practices of conspicuous consumption, creating palatial town houses and monumental "art villas" to demonstrate their high rank in society. 3. The Equites or Knights emerged as a powerful social stratum in society in part because of their involvement in the public contracting that maintained the empire. 4. Development of a slave agricultural economy in Italy and Sicily. Destruction of farmsteads throughout southern Italy by Hannibal led to a reorganization of the rural landscape toward larger estates run by slave laborers. Generally, reports indicate the development of medium sized estates for the purpose of producing wine and oil for export, a development demonstrated by the emergence of Italian transport amphoras as the dominant commercial export container of the western Mediterranean by the late second century BC. Some estates, known as latifundia, could be huge however. Many wealthy investors leased Roman ager publicus or public land, to developed cattle ranches, again worked by slaves. A conservative estimate suggests that some 250,000 persons forcibly migrated from the Mediterranean peripheries to the core regions of Italy and Sicily as a result of enslavement through conflict. Rome and neighboring Italian cities did not have sufficient police forces to monitor slave behavior. Living conditions for slaves were generally harsh and rebellions inevitable. Between 136-130 BC a massive slave revolt seized control of the island of Sicily; in 105 BC a second revolt caused upheaval throughout Sicily and southern Italy; in 72 BC came the famous slave rebellion of Spartacus, who led a sizeable army of slaves throughout the Italian peninsula, remaining undefeated until cornered by M. Licinius Crassus in 70 BC. 4. Emergence of Rome as an imperial capital. Estimated population of Rome stood at 600,000 by 133 BC. Small farmers, both Roman and Italian, migrated to the capital in search of employment and cultural benefits, even though living conditions remained squalid for all but the wealthiest elements. As late as 200 BC Rome reportedly only had 2 paved streets in the entire city. With profits of war Roman magistrates engaged in sustained building program to develop the necessary urban infrastructure -- roads, granaries, docks, aqueducts, etc. Thousands of slaves were imported to engage in artisan labor for the city. Greek language was commonly spoken in the streets, and it is estimated that 60% of the urban population consisted of slaves or people of slave origins. Urban development was made possible by the profits of war, but once Roman conflict ceased after 146 BC, revenues declined, as did public contracting. Evidence of economic stagnation by the 130s BC, but now Rome had a large surplus population that could not return to the land because of the radical agricultural changes without. 5. Changes in the military. Conquest required maintenance of a permanent military establishment in the provinces to cope with rebellions. Roman authorities continued to rely on conscription to man overseas armies, but the prospect evolved for an 18 year old draftee to spend 16 to 20 years outside Italy, all the while receiving minimum pay for military service. Little profit was to be gained from garrison duty in hostile regions such as Spain, Sardinia, and Corsica. For Rome the result was a gradual rise in "draft-dodging" as small farmers evaded the draft by abandoning their farms and moving to the city. Since the draft was based on the property assessments of the Roman census, abandonment of property resulted in decline in civic status and ineligibility for the draft. At the same time Italian allied states became increasingly called upon to sustain Rome's overseas military establishment. Allied states were required to contribute their native forces to Roman war efforts. By the end of the Hannibalic War it is estimated that 2/3’s of Roman military forces in the field consisted of allied soldiers. In this manner the allies complied with their treaty obligations to Rome. However, Roman generals had no obligation to share the profits of war with these allies. Allies received neither land distributions from conquered peoples, nor monetary bounties. The Allies likewise became discontented and began by 121 BC to demand full Roman political status commensurate with their role in the maintenance of empire. Sympathetic Roman leaders tried many strategies to obtain greater rights for the allies, but these ultimately failed, provoking a widespread rebellion among allied states known as the Social War in 90 BC. This rebellion was ultimately suppressed by force and negotiation, but the process of integrating allied citizens into the Roman state dragged on to the end of the Republican era. The stakes for Roman citizens was clear. In 129 BC the Roman census recorded some 294,000 male Roman citizens. This number jumped to c. 500,000 during the census of 84 BC following the settlement of the Social War rebellion. However, when the first Roman emperor, Augustus, conducted a census of all Roman citizens throughout Italy in 27 BC, the number reached 5 million. 6. The financial burden of empire was borne by the inhabitants of Roman provinces, paying the tithe to Rome. The effect of this burden varied from province to province, but generally the tendency was one of rebellion, suppression, and imposition of even greater financial burden. This burden was frequently made intolerable by the rapacious behavior of Roman tax collectors, who leased the tax-collecting contracts from Roman authorities and hence were known as publicani. Rebellions in the two provinces of Spain and Lusitania continued throughout the second century BC; Corsica and Sardinia revolted in 176 BC, culminating in the enslavement of some 89,000 Sardinians by Ti. Semproinius Gracchus, the father of the Gracchi. In 88 BC a “philhellene” king in the East, King Mithradates VI of Pontus in eastern Anatolia, induced the inhabitants of the Roman province of Asia to rebel and to purge themselves of Roman influence. Reportedly some 80,000 Romans, Italians, their families and slave staffs were massacred in Asia, and the rebellion spread across the Aegean to Greece as well. Generally, provincials held decidedly anti-Roman attitudes throughout the Republican era. As complex as these problems were, a ruling class more responsible than the one prevailing at Rome might have successfully mediated them. The process of enrichment and heightened political importance rendered the Roman senatorial order chauvinistically arrogant and unaccountable for their actions. Many high-minded aristocrats perceived the need for institution of better means of redress and political reform, but their efforts were blocked by a majority unwilling to relinquish their privileged position in society. In the words of one noted Roman historian, the Roman aristocracy gradually outlived its usefulness to society.